By CNN'S FAITH KARIMI, RYAN YOUNG, BILL KIRKOS, STEVE ALMASY, JOE SUTTON, SANDRA GONZALEZ, CHUCK JOHNSTON, NICK WATT. ROSALINA NIEVES AND SHEENA JONES CONTRIBUTED TO THIS REPORT. (CNN) - Jussie Smollett paid two brothers $3,500 to stage an attack on him last month, taking "advantage of the pain and anger of racism to promote his career," Chicago Police Superintendent Eddie Johnson alleged Thursday. The "Empire" actor was arrested Thursday morning on suspicion of filing a false report about the January 29 incident and appeared in court in the afternoon. He paid a bond later and was released. Smollett then went to work on the "Empire" set to shoot some scenes, CNN contributor Nichelle Turner said. The company behind "Empire," 20th Century Fox Television, has previously backed the actor. On Thursday, it said it was "evaluating the situation and we are considering our options." A statement released Thursday night on behalf of the actor said the bail hearing was an "organized law enforcement spectacle that has no place in the American legal system." 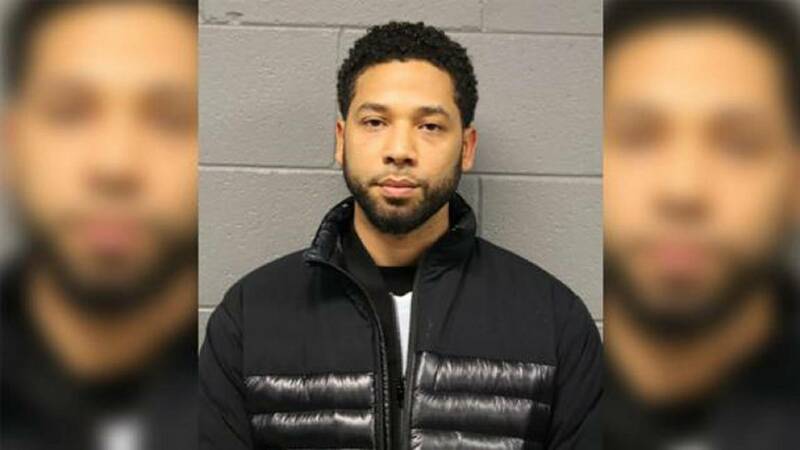 Smollett faces a felony charge of disorderly conduct for falsely claiming he was attacked by two men on January 29 in Chicago, police say. The attackers yelled racist and homophobic slurs, tied a rope around his neck and poured an unknown substance on him, Smollett alleged. Police initially treated the attack as a hate crime and were able to track down the men, in part, through cabs and rideshares that they took after the attack, Cmdr. Edward Wodnicki told reporters. They learned the men were in Nigeria. Investigators met the brothers at customs when they returned to the country, Wodnicki said. Phone records indicate Smollett talked to the brothers about an hour before the alleged attack, an hour afterward and after they had left the country, authorities say. Investigators have the check Smollett used to pay Abimbola Osundairo, prosecutors say. The brothers' motive for helping was money, Johnson said. The superintendent said, however, that Smollett was given no more attention than any other alleged crime victim, but he lamented that resources devoted to the Smollett investigation could have been deployed elsewhere. They did not elaborate, but surveillance video from a beauty supply store captured the day before the assault, appears to show the brothers purchasing a ski mask, sunglasses, a red hat and other items. Asked why Smollett chose the brothers, who prosecutors say both appeared as extras on "Empire," Johnson said it was probably because he had a previous relationship with them and "knew that he needed somebody with some bulk." Selfies posted on Instagram showed the muscular brothers with their shirts off, flexing, and prosecutors allege that Abimbola Osundairo, with whom Smollett has been friends since 2017, had previously worked out with, socialized with and provided recreational drugs for Smollett. Prosecutors allege Smollett directed the brothers to utter the remarks and epithets while attacking him. The attack was supposed to go down at 10 p.m. on January 28, but was postponed until 2 the next morning because Smollett's flight was delayed, prosecutors say. Smollett took the brothers to the site where he wanted the incident to occur on January 27 and pointed out a surveillance camera on the corner he thought would record the attack, prosecutors say. They say the plan was changed so bleach would be used during the incident instead of gasoline.